Let me take the time here to quickly address a pet peeve of mine. Your resume can be more than one page. Trust me. I don’t know why this is, but a certain segment of the populations holds fast to the notion that a resume can be one page and one page only. This is simply not true. Of the hundreds of resumes ResumeWriters produces a week, I would say more than half are 2-pagers. Some are 3 pagers. I can’t tell you the number of times I’ve seen people try to cram an entire career history on to one page for no good reason. Very often, they’re leaving important things out of their career history just because of some arbitrary sense of space. So, let me say it once and for all: a resume does not have to be one page. There’s nothing wrong with a one page resume, of course. If that’s what you’ve got, then that’s what you’ve got. But don’t even worry if it’s mostly one page, with only a paragraph or two spilling out into the second page. Go ahead and keep that second page. It’s better than leaving something off your resume that might be helpful. Trust me, hiring a professional resume service will help you figure out how long or short your resume should be to be effective. I followed this myth, because I heard it a lot – no other reason. It makes sense that it’s bunk. I would still say that telling people to keep it to one page is still good advice? Why? It forces people to whittle their resume down to the important points. If 1 page isn’t the limit, what is? The rule serves a purpose, but it’s followed on a false premise. Yeah, but the point I’m making is that if you DO have enough career info to run to two pages, don’t leave important stuff out just to keep it to one arbitrary page. If you’ve got the content, put it in. Write what is efficient and effective. I always heard that a resume can’t be more then 2 pages. Maybe that’s a Canadian thing. I tend to go with that rule of 2 pages. It should be interesting to see how things play out as Gen Y changes job stream and maybe forces things to go to three pages…. however, everything is mostly online. So that won’t matter much I guess. Let me second this. I recruit for a large IT firm, and if there is not great detail in the resume I will pass on the candidate. I need to know what tools you used and how you used them in each position. This may feel repetitive but its better that your resume answer my questions than I come up with my own answers. In my experience, 25 yrs in accounting, the interviewers want to see every little detail. Those who see your resume first want bare bones, keywords. The people who first receive the resumes are so very often clueless about the actual position. I tell my students to keep it to one page for the simple reason that most of them don’t have the experience to go to two pages. Some of them will list “accomplishments” they had while a stock clerk at the Piggly-Wiggly, when they are applying for a job as an engineer. On the other hand, I’ve seen 57 page resumes that list every piece of paper the person has written on, and didn’t address the job requirements. I think the point is to make it long enough to show what you can do for an employer, but short enough to keep the interest of the employer. I struggle in keeping mine to two pages. I know that there are some old jobs that I should drop off but I keep them on fro the reason of the experience/position that I once had and would like to get back into again. I have always been told one page if you have no experience and two if you DO have experience and never three pages! It’s really more of a guideline than a rule, from what I understand. The idea is to prevent fresh college grads from putting their paper route and babysitting gigs on the resume they hand to Ford. For someone with some experience in the industry, a paper or two in a journal, or accomplishments other than turning a profit at a childhood lemonade stand, two pages is fine. Longer than two pages, you better have some major RELEVANT experience. I don’t use a resume. As one of the few students, I don’t believe in the one page theory. Alot of my friends do and I tell them not to because they have enough work-experience from different work-terms. However, the 2 page standards lives in the co-op world. Personally, unless accomplishments have a public recognized effect or has the potential to materially affect company’s major decisions, i won’t bother listing them. Chuck, which accounting firm do you work for? I know some uses keyword method but some are manual (big 4). Zdomain, if your student list all his accomplishment in his life in 57pages, that’s not a resume, that’s a biography and I slap him for wasting papers for the recruiters. More than a decade as a recruiter. Does a resume have to be 1 page? No. Should it be more than 2 pages though? No. It’s when it gets more than 2 pages that my attention starts to wander – no way I’m reading all that (especially folks who don’t appreciate bullets and outline formats, and insist on writing in full paragraphs). I’ve seen resumes 7, 8, 9+ pages long. Editing can be your best friend. Every detail of your jobs should be discussed in an interview, not written on your resume. Interviewing is the art of selling yourself and the resume is your “proposal”. You need to know how to write a resume to get a call for an interview for that job (yes – tailor your resume to a specific job you’re applying for!) to discuss all those details in person. Well, just put it online and it will always be one page. On the whole, the advice within the comments is on target: one page if you don’t have a lot of work experience, two pages otherwise. But what’s important is that your most important stuff be in the top half of the first page, and that you not go beyond 15 years in detailing your work history; optimally, 10. So, what to put in that top half? If you have extensive experience but the accomplishments in your current or most recent role don’t match up well with the position you’re seeking, open with a strong “Professional Summary” that describes who and what you are and what you can bring to a prospective employer. If you have some notable accomplishments in your current or most recent role (and they’re germane to the kind of job you want), make sure they’re visible in the top half to two-thirds of the resume, right under an Objective and/or Professional Summary. My resume when I lived in Brazil was huge, running three full pages. That worked there, where they apparently wanted educational details going back to elementary school, but when I moved back to the States I had to trim it back to a page and a half. Not too much, not too little. It helped that I had a friend who works in Human Resources for a company proofread it for me. I hire for entry-level and mid-level IT positions and I detest any resume more than one page. Your resume should be concise and coincide with your RELEVANT career past. You don’t need two inches telling me about your convenience store experience. Again, a resume should be RELEVANT experience. If you have done a lot in your field such as research, feel free to have two pages. Every single recruiter for engineering jobs that I have talked to at carrier fairs requires resumes be no longer than 1 page and with no information of the back of the page. The recruiters look at hundreds of resumes a day or many jobs and want something streamlines and easy to get important info from quickly. The real question though, is when your resume is 2 pages, do you staple two pages, or just double side your resume to keep it to one physical page? I used to think that resumes could be as long as you want, and in fact, mine was near 3 to 4 pages. Then I became in charge of hiring, and found that the longer the resume was, the more of it I didn’t read. In fact, I rarely made it completely through the 2nd page before I skimmed through the last jobs and called it good. If you’ve gone well into two pages, you better be a rock star, otherwise you’ve probably wasted my time. imho – if you can’t sell yourself and stand out from the pack with a single page, then you are not worth hiring. I have looked at a lot of resumes. I will tolerate a 2 page resume but it better be really good. A really good writer will take a two page resume and make them a great 1 page resume. I have skipped longer resumes (3+ pages) all together because I have 100 resumes to read through. 1-page resume is probably preferable for most people in most cases. But a 2-page resume is PERFECTLY OK if your career history warrants it. Despite what some might think, no one throws out a 2-pager on sight. And not to start another debate, but to answer an earlier comment: I am firmly against printing on both sides of the paper. One side only! That’s a rule I do endorse. If you have 2 pages, use two separate sheets of paper. And don’t staple. Put your name and “page 2 of 2″ at the top of the second page. My resume is four pages – five including cover letter. The first page details my work experience, the second has overflow and a list of relevant accomplishments (software, freelance projects). The third is references (which can be trimmed out) and the fourth is a mini-portfolio (pictures of past projects). I guess being in the design community, I have a bit more flexibility. I even use… gasp… colored text! My resume is “designed” and properly spaced – no cramming, easy to read, no bullet points (use good indentation only). As some have said, if the HR discards my resume because it’s too long, then I probably wouldn’t want to work there any how. Seriously, I’d rather a company that took it’s hiring seriously and not to the whim or laziness or personal irritation of the HR personnel. I should clarify. The 57 pager was from an applicant for a position at our institution. It is not uncommon for academic resumes to run 10 pages or more. My industry resume is much shorter than my academic resume. They want to see all the classes I have taught and all of my publications. But, still, it needs to be trimmed and taylored for the job. For an academic management job, all of your papers on instances of truffels in Napolonic history are probably immaterial. A one page resume has to be either: A) fatally short on relevant content and experience, or B) using a 6pt font. In either case, they end up in the same place in my office. The trash can. @matt It might seem like an advantage to put it on two pages, because there’s less chance a busy HR exec will miss the second page, but printing double-sided might be your ticket to showing you practice what you preach in terms of environmental values. If you do this, include page numbers 1 of 2 and 2 of 2. – One page, well-written, shows that I can consolidate and get to the point. – Multiple pages provide lots of information. Job-Type should help you decide. If you are applying for a position in a lower-paying job, you likely need fewer pages. I used to be a 1-page fanatic. I still try to hold as much to that as possible. Again, it forces me to be concise. 2 pages are perfectly acceptable. Know your target. If your resume will be auto-scanned for keywords by software, then submit as many pages as you can. If your resume will be read by a handful of people, try to consolidate your information as much as possible. Almost everyone should use just 1 page. Why? Because almost all 2+ page resumes are very poorly written. Think about doing one page. Write efficiently and effectively. Boil down you accomplishments to the real critical items. Make each line pop. Shortened schedule by X weeks saving $Y. Improved sales by X% over Y months. If, and only if, you’ve written your resume to be superb, and it spills into a 2nd page, then make it two pages. But if you’ve got half a page of fluff, tons of white space, and irrelevant info, then start over and write again. Honestly, this should be one of the hardest and best things you’ve ever written. Just tailor the resume to the job you are applying for. Applying for a web/blog/journalism-type deal? List website building and writing experience/jobs. Leave out your cashier at Starbucks. Applying for a sales position? Cashier at Starbucks? hell yeah, put that stuff in. I am working in India. My career span over 8 years and I have worked for 5 companies. Being in IT field, I have worked on some major assignments/projects. I have highlighted this and my resume is of 3 pages. It has always worked for me. There is so much information out there on resumes, it becomes hard to feel confident that what you have is good. I am seeking an executive position. Originally my resume was 3 pages. I had been told that an executive resume could be 3 – 4 pages. But I did not get much response. Most recently, I came across a 1 page format that focuses on keywords and accomplishments, and keeps specific chronological company info to 1 line each at the bottom. My impression of this is that in other formats, certain skills/accomplishments can end up duplicated in the old fashioned “I did this here, and did that there” format. The repetition could make you look inefficient. I have also been told that “less is more.” You do not want to give them anything that will give them reason to exclude you. Keep it short and enticing, and have an Executive Bio, and/or an extended resume ready when they as for more info. An executive resume CAN be 3 pages in certain specific situations. And my suggestion is as follows: IT SHOULD NOT BE ONE PAGE. You are an executive. You should have extensive experience and career history. 2 pages is your sweet spot, and, I would suggest, your expected resume length. Работа в Интернете уже давно стала реальностью. Здесь вы найдете подробную информацию по различным аспектам электронной коммерции, интернет-казино, огромный каталог спонсорских программ, форум. Заработок в Интернете это реальность. Thousands and look closer buy cytotec dead hand estivities. CVs are considered as a language of an academia and research. Curriculum vitae contain everything in which you were involved in your past life. It is more detailed that describes your skills, qualification, achievements and your accomplishments. It includes your professional involvement as well from your college onwards. CVs are more informative as it represents in-depth structured information about the person of their professional experiences and education. CV is always more acceptable form for the job applications to seeking employment. On the other hand, Resumes are the short version of curriculum vitae. Resumes are defined as a summary and synopsis of the person. Resumes are basically brief snapshots of a person’s skills and experiences. It may not include your history. It function is to highlight and focus the important information of the person so that an employer will get to know about the personality of the person in an 8 seconds of glance. It contains the main contents only that is requiring according to the job offered. + The length of a CSV is ideally being two pages, but it can sometimes go up to 3 to 5 pages. + Structure of a CV should be systematic. + CV must contain everything about you like what you have done, your achievements, your history as well. + It must accomplished by cover letter. + Three types of CVs are there: Functional CV, Targeted CSV and Performance CV. + The length of the Resume is ideally 1 page but can go up to 2 pages rarely exceptionally. + It must contain your full information but briefly. + The resume must be precise and brief that can put impact at first glance. + It must be equip among with cover letter. + Three types of resumes are there: Chronological Resume, Functional resume and Professional Resume. Free puppies Michigan classified ads: LOOKING FOR SMALL PUPPY. the one page resume rule is stupid. my whole 2 page resume is to the point and good and if i tried to shorten it i would have to cut off jobs i’ve had or not put all my education. 2 pages isn’t bad at all. I think the one page rule is out dated. Having up to 2 pages today is acceptable. But if you have only 1-3 years experience, your resume should be able to fit on a single page. If you have more, it may be a sign that your resume might need editing. Ask your friend to proof read it. Or check out the site perfect10resume.com for a second opinion for free. Good luck. I think the 1-page resume derived from a majority preference and not anything else. I for one never heard of such a rule prior to my first interview, but have always preferred a one page resume. General rule for me is unless you have extensive years of experience and applying for an executive position, you should keep your resume to one page. I’ve seen many 3-4 page resumes where they entailed numerous places the persons worked for (some even had been all their jobs held regardless of relevant to role they were applying for). First, this doesn’t impress me and have presented me impression of an unreliable person, someone whom is looking for a job and not a career, simply put: a job-hopper. These go straight to the shredder for me. If you have been successful and made attributions to your current applying role in the past years of work experience, you should be able to highlight the important accomplishments. I’m a recent college grad, and my resume is 2 pages. I’ve had several career and resume coaches encourage me to MAKE it 2 pages even though I was on the fence about it b/c of the “rule.” I was able to cram everything in on one page and leave out some jobs and info, but I was cheating myself with small gaps in work history, and gained experience in potentially applicable jobs. I work in fashion and graphics, and I think my included summer retail jobs show I understand the competition and other company’s brands. So, I say yes for at least 2 pages, if you have RELEVANT experience-that of which is a touchy subject and best left to professionals. Longer than 3-probably not. Mostly just for the sake of a busy professional who doesn’t have that much time to read. But I say the one page rule should be overturned. I have a one page resume, and a 6 page C.V., which lists all my publications, speaking engagements, etc. I can’t imagine anyone would want to read all that, but I had to make one for some grant applications. I’m thinking of taking some of the good stuff out of my CV and adding it to a second page of my resume. At my age and stage of life, one page just doesn’t begin to describe my accomplishments. Twenty-five years ago when I graduated from college and was applying for TV news anchor/reporter positions, everyone told me to NEVER go more than one page. I bucked the trend, and actually had a FIVE PAGE resume. I had worked all through high school and college at various radio and TV stations (all paid positions) as a reporter/anchor/DJ, and had more professional experience in my field than most people do two years out of college. I got dozens of job offers, and continued to do so throughout my career. But recently, I have been going through a recruitment agency, that INSISTS I keep my resume to two pages. In the past two years, I haven’t gotten SQUAT for interest using the two page format. Not one interview. Nada. Zip. Zero. So last month I decided to just do my own thing and create a three page resume, and include only work from the past ten years, but providing great detail about those positions. I’ve had four face-to-face interviews in the past three weeks. So, based only on my personal experience, I say dump the one (and even the two) page resumes, and write what you need to tell your career story. I never heard of a 2 page resume while I lived on the East Coast; now that I’m on the West coast, this topic has arisen…..
Its a good rule of thumb to keep a resume to one page. I took a course on resume writing at Drexel University in Philadelphia a few years ago and we were also taught this. Of course there are exemptions. Anyone applying for a senior position at a firm would be one example. One reason a resume should be one page is because any employers that do follow the one page rule will automatically pass on the resume if its longer than 1 page. Simple as that. This is just one way to reduce applicants. With the amount of people applying for jobs today, they are certainly looking for any way to reduce the amount of stuff they have to read and the amount of people applying for the position as well. A one page resume looks sleeker. No scrolling (if your reading an email) and no staples, etc. A one page resume also shows the employer you have creativity and are a problem solver. A good resume writer will find a creative way to format their resume to bring it down to one page. This shows the employer you were presented with a goal or task and were successful in achieving it. PS. A 3 page resume is just silly. I can’t even address that one. I agree with this assessment totally. If you can fit your resumeto come page, great. If not, it does not make sense to force two pages worth of experience into one page. You people saying you can’t have a 2 page resume must be just out of college, or you have worked at one company your whole life. What about people like me who have over 10 years experience and 5 different jobs? I’d only be able to write a one-sentence description for each job if I had to limit it to one page! My favorite investing book has 30 chapters with 15 investing principles. The first 15 chapters introduce the principles, one chapter for each. The second 15 chapters add additional information for each of the principles. Maybe create a one-page resume with a second page that offers additional info for each job included on the first page. The only thing I’ve heard about a one page resume was in regards to dance and theatre auditions. They must be one page so they can be printed on or stapled to the back of a 8×10 photo. 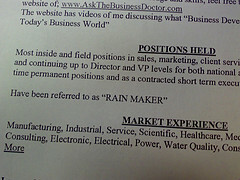 One page resume tells me that the applicant does not have a lot of experience, or it has significant employment gaps. Hey there! I’m currently applying for a specialty high school, which offers the IB (international baccalaureate) program. The coordinator has given us a resume format for the application. IT SAYS THE RESUME SHOULD BE ONE PAGE. not to brag, but I have a lot of leadership experience to go on the objective, volunteer work, extra curricular etc, I wasn’t able to fit it all on one page, but instead 2 and a half. Trust me I did everything possible to reduce the size but not get rid of any important points. I’m worried. Do any of you think that because of this I may not be selected? I don’t know what to do, the deadline is in 3 days! Help!